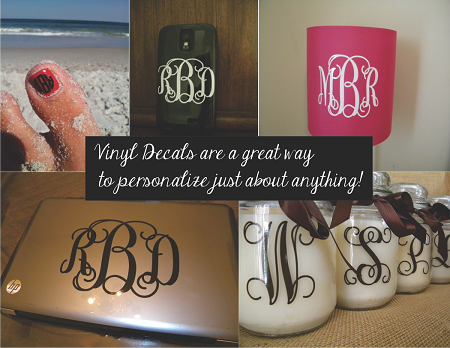 Vinyl Decals make wonderful gifts! 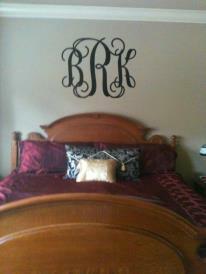 Range in size from nail decals to huge wall monograms! Monogramsical's Vinyl decals are made of high quality commercial grade vinyl. Meant to last for 5+ years of outdoor use. Most smaller decals are super simple to apply.... simply peel and stick! Larger decals will come with step by step instructions. All of our decals are sure to make a big impact! We cut them in sizes from nail decal to 24" tall! If you need a size not listed on the drop down menu- just send me a note and we can get something cut just right for your space. Our email is: info@monogramsical.com.